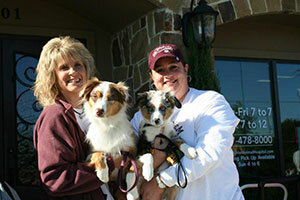 Experience the Richter Animal Hospital Difference! "We've been with the RAH family for quite a few years, and would never think of going elsewhere. The staff are friendly and compassionate, and we couldn't be happier. The thoughtfulness, sensitivity and incredible kindness received when our elderly Shepherd passed on was a gift without measure. Our other three pets continue to receive the best of care. We recently boarded our other senior dog with RAH, and he came home showing no anxiety at all; he really enjoyed his stay! We appreciate y'all so much!" "I only wish I would've switched over to this vet sooner. Everyone is so friendly. I always walk in with my young kids and dogs in tow and they go out of their way to make our trip to the vet easier. They are extremely thorough in explaining everything and I have never felt rushed through an appointment. I know that they care about every animal that they take care of as if it was their own. I recommend them to all of my friends." This place has changed our lives! When we got our Aussie puppy we needed to find a constructive outlet for her energy while we worked all day, so we went to Richter Animal Hospital to check out their daycare services. The daycare staff is amazing and attentive. They know every dog by name and love each baby as if it were their own! The playground equipment, pup-sicles, and swimming pools ensure exhausted dogs at the end of the day. We were so impressed with the daycare staff we decided to use their veterinary services. With three animals now, we have had the pleasure of using all three vets and have been thoroughly impressed with their knowledge and expertise. Most importantly, all three are compassionate, easily accessible and always willing to answer numerous questions. The entire staff - from the technicians to the front office - go out of their way to provide exceptional customer service. You and your pet are greeted by name with smiles on their faces and treats in hand. In regards to boarding facilities, they are top notch! This is the only place we have ever felt safe leaving our babies behind while we travel. We know they are slumbering in immaculate suites with lots of love and attention! All in all, we have had positive experience after positive experience at Richter's. We share our experiences to all that we can so that others will have the opportunity to benefit from the care these people provide! We count ourselves blessed to be included in the "Richter Family"
In 2001, we adopted two precious dogs (Mindy and Misty) from a shelter and needed to find a veterinarian to take care of them. We began using a large clinic close to our home where we met Dr. Richter. After meeting him and seeing how considerate and compassionate he was with our babies, we knew we had made the right choice. We always asked for him whenever we needed to take "the girls" in for checkups or sick visits. When we found out Dr. Richter was opening his own animal hospital, there was no question that we would transfer our babies care to Richter Animal Hospital. We had developed great confidence in Dr. Richter and knew that he truly cared about the girls and giving them the best care possible. Since making the move to RAH, we have adopted two other dogs (Sammy and Toby) and referred all of our family and friends to RAH; those that have gone to RAH never return to their previous vets. Additionally, our babies were apprehensive to go to the numerous groomers that we had tried until we started using Katie and the crew at RAH. They are so kind and loving to our pets that it helps make the trip to RAH easier when it comes time for those nasty checkups. All in all, everyone on the staff, including Dr. McDaniel and all of the techs, seem to care as much for our little loved ones as we do. Words can't begin to express how profoundly grateful we are to have found the awesome staff at Richter Animal Hospital . They have been there for us during our saddest moments and our happiest times. Two years ago we moved 25 plus miles away from RAH. Although there's many Vet Clinics within a few miles from us, we would never consider leaving RAH. We've always known they are just a phone call away when we need them. And there have been many, many phone calls and visits…..and many groomings! Thank you Dr. Richter, Dr. McDaniel and all of the staff. We love you guys! My name is Higgins and I am an Old English Sheepdog (Sheepie). I live in Kennedale with my humans, Eileen and Kevin Migdal. When my human mom and dad moved here 2 years ago they were so concerned that they would be able to find a good Vet to take care of their 11 year old Sheepie, Nana. Not only did they need a good Vet, but they also needed a groomer and a boarding facility. As soon as my mom walked into Richter Animal Hospital she knew she was in the right place. Everyone was so friendly and so very kind to Nana. Plus, not only did she find good Vets she also found a good groomer and a boarding facility all under one roof! Dr. Richter and Dr. McDaniel took such good care of Nana making sure she was comfortable in her senior years. Then one day Nana got real sick and they had to send her to a place called the Rainbow Bridge. I don't know too much about that place except that it makes humans very, very sad when they have to send a pet there. I heard my mom say that Dr. McDaniel was so compassionate and kind especially to my dad who was heartbroken. A couple of month after Nana passed, they adopted me. I had a real bad tummy ache when I first came to live in Texas and Dr. Richter and Dr. McDaniel made it all better. Once a month I get to see Ms. Katie, the groomer and she never gets mad at me when I make a big fuss about getting my nails clipped - I don't like that very much! Once I got to stay at the boarding facility and everyone was so nice to me and even gave me treats. I also got to take some obedience lessons from Ms. Becky because my mom said I didn't have very good manners. Ms. Becky didn't even lose her patience when I didn't pay attention during my lesson. Uh Oh! I've got to go! Here comes my mom! She doesn't know that I like to use her computer. Take it from me you should bring your pet to Richter Animal Hospital. They are very kind to animals and they also like humans a lot too! Maybe I will see you there sometime.